Devin Nunes (previously) is a Trump-loyalist whose scandals have ranged from secretly moving his family farm to make it easier to hire undocumented workers to a bizarre obsession with the Steele Dossier; and like a lot of far-right types, he's big on "preventing frivolous lawsuits" (which is to say, he wants to make it harder for the public to sue companies that harm them, which is why he cosponsored last year's Discouraging Frivolous Lawsuits Act. Another trait Nunes shares with a lot of far-right creeps is that he can dish it out, but he can't take it. Just as Trump is (not so) secretly doing all the things he accuses his opponents of doing, anyone who talks about "SJW snowflakes" is almost certainly a thin-skinned, insecure thumbsucker who can't bear to be mocked. That is how Nunes came to file a $250,000,000 lawsuit against Twitter and two parody accounts on the service, @DevinNunesMom and @DevinCow (AKA Devin Nunes's Cow) for hurting his feelings on the internet. 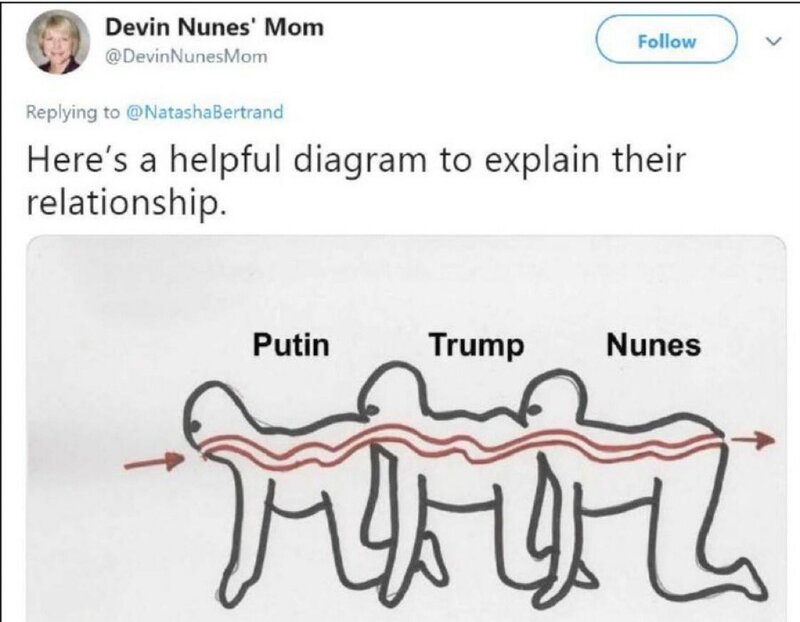 Nunes is upset that he was called a "herp-face," and is really upset about a human centipede meme that depicted Nunes, Trump and Putin as generic, labeled stick-figures with their mouths grafted onto one-another's anuses. This tweet may just be the greatest exhibit ever filed in a lawsuit.